The Stratosphere is effectively the northern terminus of the Las Vegas Strip, the world famous portion of Las Vegas Boulevard that is home to dozens of the world's largest hotels and casinos. 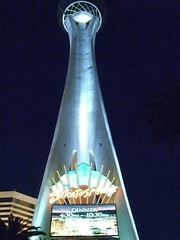 The Las Vegas Strip is about 3.5 miles long - the distance from the Stratsophere to Mandalay Bar area on the south end. Other properties on the Northern end of the strip are the Sahara, Circus Circus, and Riviera. You'll find that the most beautiful, extravagant, and expensive hotels tend to be in the center of the strip - Wynn, Encore, Bellagio, Venetian, Caesar's Palace. Although there are several very nice "still big and beautiful" hotels at the South Strip: MGM, Mandalay Bay, Luxor (though it seems to be in something of a decline based on my last trip). The two ends seem to be falling into greater disrepair over time although the Stratosphere seemed to be holding up pretty well as the north strip anchor property. There are spectacular carnival rides near the top of the tower though note the steep admission even if you just want a nice view from the observation deck. It's not clear to me if you can eat at the restaurant and avoid the high price of a tower ticket.